I've been wanting to make a little book for the dolls. One with actual pages. 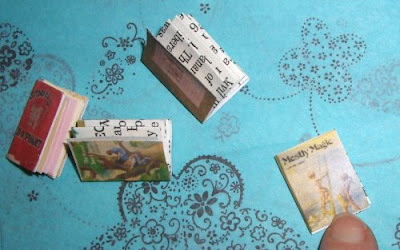 Thank you to Mommylion, a commenter who pointed out this mini book tutorial at Hitty Print Mini. It worked out great! 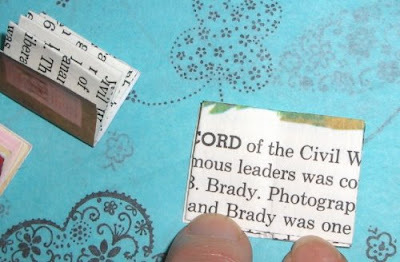 I printed the covers for the little doll house books from Hitty Print Mini and then used little strips of words cut out of a no-longer-useful book. By the way, I am always looking for books at the thrift store that have beautiful pictures or words -- something that would be great for a doll house project, but is no longer readable. I would much rather reuse a book than to see it thrown away! My children LOVED reading through these little doll house books. A word here or there that jumps out and makes them think of something historical! Fun stuff. The little doll house bookshelf up next!